GBST provides global financial institutions innovation solutions for sustainable growth in an increasingly dynamic and complex business environment. 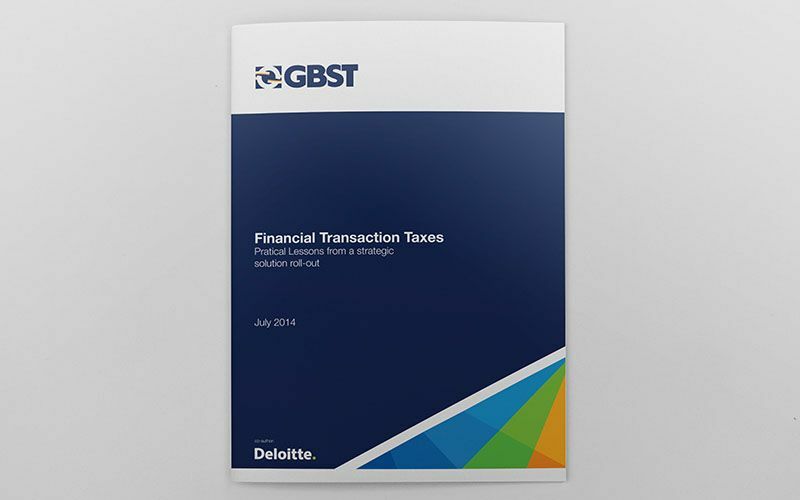 The collaboration between GBST and Deloitte put together a detailed whitepaper on Financial Transaction Taxes and the changing commitments of their corporate customers. Pink Tiger Media were engaged by GBST to create a campaign to explain the features and impact of this European regulation. We engaged with GBST’s subject matter experts to understand the problem statement and the GBST solution. Consequently we recommended bringing one of the big four tax advisory firms to the table. We engaged Deloitte through their leadership in Hong Kong and London to coordinate tone of voice and style, providing layout and editorial advisory. We launched the whitepaper in both print and digital formats for both GBST & Deloitte’s global tax advisory.